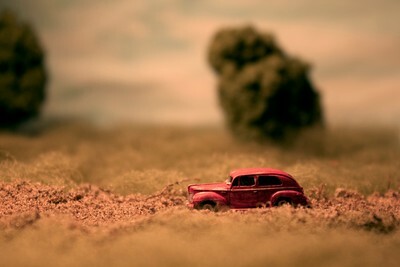 The car in this image is an N scale miniature, meaning it's about 2 cm long. I got it as a metal unpainted model and used hobby acrylic paint and sharpie to make it what you see here. The trees and grass are also train scale model accessories. The dirt road is real dirt, and the backdrop is a water color painted sheet of paper. I created this image in 2012 at my apartment at the time. I set everything up on a piece of foam on my bathroom counter. I shot this in the middle of the night. I was submitting it as part of a series the next day in my college photography class. The props had just arrived in the mail that day and I worked on it hours into the night after I got off a late shift at work. Being as I photographed this scene in doors the time of day didn't matter much - it just effected my sanity. For the lighting in this image, I allowed the ambient light of the overhead bathroom fixtures work their magic. I wanted the scene to be in daylight, and as it's such a small set up compared to the surrounding room light, the bathroom lights emulated sunlight well. This was one of my first ever miniature images, and I didn't have a macro lens yet. To my surprise, the kit zoom 18 - 55 mm kit lens that came with my Canon EOS Rebel T1i worked just fine for this landscape as I didn't have to get too close to capture the detail of the car. This image was shot at a 1/13 shutter speed, however, I couldn't get close enough to the scene with my tripod, so I simply set the camera on the bathroom counter and used books and whatever else I could grab to elevate it to the right level. For this photo assignment we had to create a narrative series. I had the hardest time coming up with a plan and didn't settle on something until it was almost too late to get everything together in time. I decided on creating a series detailing the news of a soldier's death during WWII being delivered to his loved one. I can't recall how I settled on such dark subject matter, but after I did I set about figuring out how to give the set an overall Americana and time period appropriate feel. I focused on a red, white and blue color scheme and for that I painted the car you see here red. While I was happy with the series at the time, since, I've only chosen to keep this image and another featuring this car in my portfolio. Yes. In everything I do, I adjust color balance, level and occasionally brightness and contrast. I did all of this here, just to get the image to look like what I had seen in front of the camera. I then also added a warming filter to give the image a more dated look, to better reflect its time period. I alternate between my Canon EOS Rebel T1i with my 100 mm macro lens, and my Olympus TG4 Tough. The Olympus is compact and easier to travel with and use quickly. For macro shots I set it to microscope mode and attach a ring flash. That said, I'm in love with my 100 mm lens and the crisp details I can get in close up shots with it. If I'm working in my home studio there's no doubt that this is the camera I'll use. Other items I have on hand is my zoom lens, a lens baby control freak tilt shift lens, a tripod, and a table top studio with small studio lights. Move slowly. With images of miniatures, make sure you have everything the way you want it to look in front of the camera before you begin adjusting lights and photographing. The smallest details can be so important in making the viewer question the reality and scale of the final image. Shallow depth of field helps a lot in the mystery here. Also, really observe your surroundings when building scale models. I've often taken images where there's a stark divide between the sky and the field in front of it. There needs to be enough distance between the front and end of your set that it's believable that it's an area stretching further than your eye can see.